Everyone loves Biryani at home. I love to cook Biryani and I normally make sure that the quantity is more than other dishes as everyone in my family will go for more than 2 servings in case of Biryani. However till now, I have never added any biryani masala purchased from store, during Biryani preparation. Instead I grind masala at home which is far better than what I get from stores. If you start use homemade spice powder for your cooking, you will never prefer the masala from shops. Fine, after entering into the blogging world, I have come across many biryani preparation methods. I found few recipes that suit my family’s taste and way of cooking. I bookmarked such biryani recipes. One among them is Shireen's (From RuchukRandhap) Egg Dum Biryani (Anda Dum Biryani). I wanted to try it since I never made a dum style biryani before. 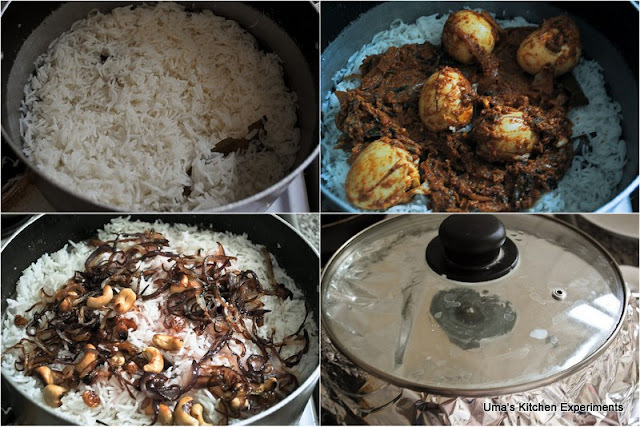 Her detailed explanation about the egg masala preparation, cooking the rice and layering helped me to bring out perfect results. Though the steps described below are a bit time consuming, it is worth trying out as you’ll get a perfect aromatic and tasty biryani. You need to do some multitasking here to save time. While eggs are hard boiling, chop the onion and tomato and prepare caramelized onions. 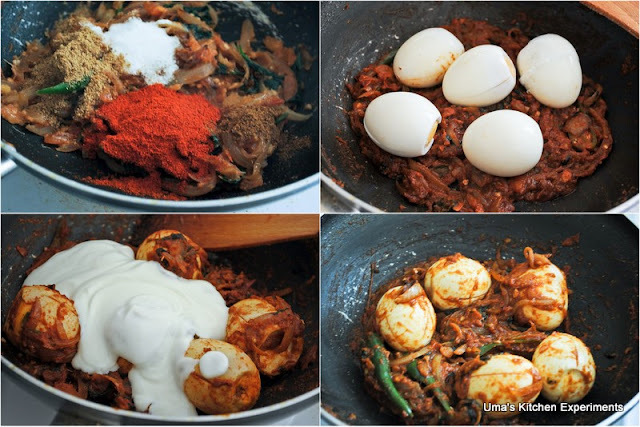 While cooking the rice, prepare the egg masala. By this way, both rice and egg masala can be done at approximately at the same time and they would be ready for layering. 1) Hard boil egg for 10 minutes. Peel the skin and using a knife, make slits on four sides without breaking it. Keep it aside. 2) When eggs are boiling, heat 3 tablespoons of oil in a frying pan / Kadai. Add thinly sliced onion and fry till they turn golden brown in color. Make sure not to over fry as it tastes bitter if you do so. Transfer the contents to a plate and set it aside. 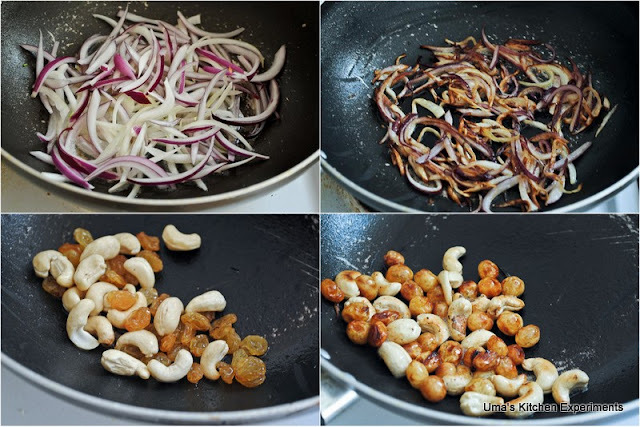 3) In the same frying pan, add cashews and raisins and fry till the cashews turn golden brown and raisins become pulpy. Transfer it to a same plate where we kept onion and set aside. 4) Take 3 tablespoons of milk in a small bowl. Microwave it or warm it using stove. Add the saffron strands and set it aside. 5) Soak the rice as per instructions given in the pack. I did it for exactly 30 minutes. After 30 minutes, drain the rice and keep it aside. 1) In the same pan which you used to fry onion and cashews, heat oil. When it is hot, add the sliced onion and fry till they are translucent. 2) Add green chillies, mint leaves, coriander leaves and chopped tomatoes. Fry till everything gets shrunk. 3) Add ginger garlic paste and fry till the raw smell goes off. 4) Add biryani masala, red chilli powder, turmeric powder, garam masala and salt. Continue frying till the raw smell of the masalas goes off. 5) Add the hard boiled eggs and saute till the masala coats well with the outer layer of the eggs. 6) Slow down the flame and add the yogurt in batch by batch. Stir well after each addition to avoid the yogurt gets curdling. Mix well. 7) If you want this masala in little watery consistency, then add 1/2 cup of water. Mix well. Cover and cook till the oil separates from the masala. All these has to be done in low flame. You will get a thick egg masala as a result of this. 8) Taste and adjust the spices. Finally add the lemon juice and turn the flame off immediately. 1) You need a big pan with lid that fits properly to the pan. If you don't have one, Use your pressure cooker without weight/whistle. Make sure it is large enough for layering the egg masala. 2) Heat oil in it. Add the crushed cardamom, cloves, cinnamon cticks, star anise, bay leaf and fennel seeds when the oil is hot and toss it well. 3) Add the drained rice and fry till it slightly change in color. It takes 2-3 minutes. 4) Add the warm water now gently mix well without breaking the rice grains. Add salt as per taste. Remember we added salt already to the egg masala. Make sure to add salt accordingly. 5) Squeeze the lemon juice and mix well. 6) Cook in high flame. When the water starts boiling, reduce the flame and cover the pan using the lid. Cook as per instruction given in the pack or 8-10 minutes or till the rice cooked well without any excess water. At the same time, make sure not to burn or over cook the rice. Once done, very gently fluff off the rice using a fork. Turn the flame off. Now, we can start the layering. 1) Transfer 3/4th of rice from the container to another large bowl. Do it carefully without breaking rice. 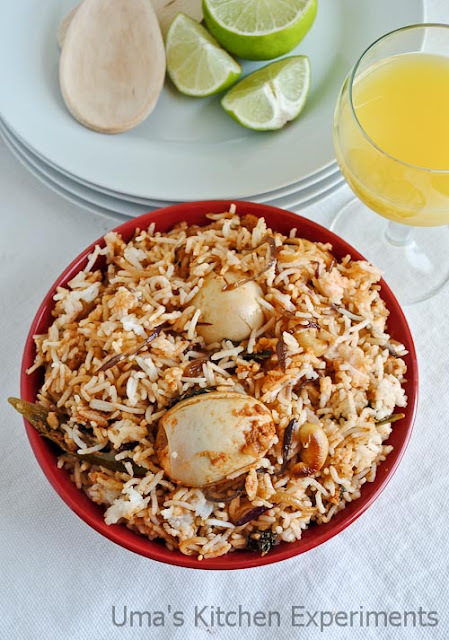 2) Divide the egg masala and spread it evenly on top of the rice left in the pan. Sprinkle little fried onions, cashew and raisins. 3) Layer it with half of the transferred rice, from the bowl. Again, spread the remaining egg masala and sprinkle some fried onions, cashews and raisins. 4) Finish it with remaining rice. On top of it, spread the remaining fried onions, cashews and raisins. Sprinkle saffron soaked milk evenly. 5) Cover it with aluminum foil then place the lid. Make sure no steam is escaping from the pan. 6) Place this pan in very low flame for 15-20 minutes for dum. The time might be varying based on the rice brand. So, make sure to increase / decrease the time based on the rice type you use. 7) Once done, remove the lid. You can sense the wonderful aroma of biryani. Fluff off the biryani and break the layers to mix well. Serve hot with raita any of your favorite gravy. 1) If you don't have saffron at home, use red food colour. However, you might miss the aroma of saffron in biryani if you use food color. 2) I haven't added biryani masala. Instead add more red chilli powder, coriander powder and garam masala. 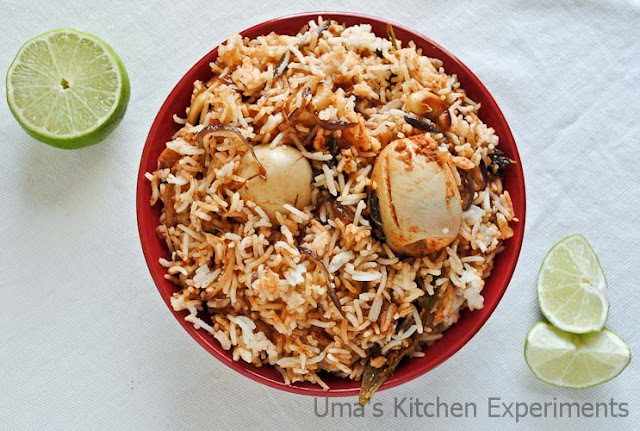 3) Cooking rice is the very important step in making dum biryani. Make sure to cook only up to 90% with grainy texture which is very suitable for layering. After finishing the dum, the remaining 10% will get cooked. So follow the instructions carefully in the pack. 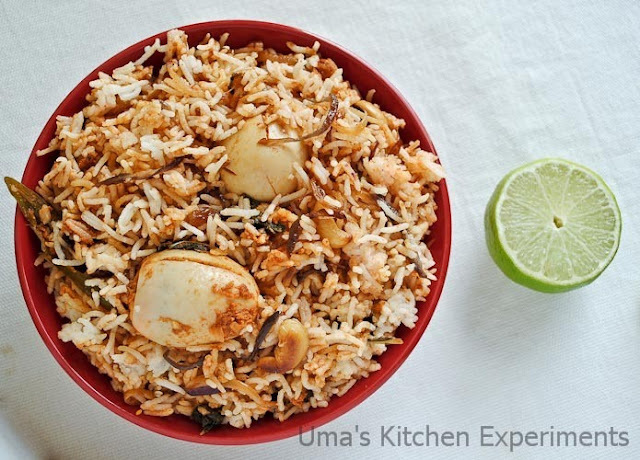 4) If you are not confident in cooking rice in open pan, you can also pressure cook it and then do the layering. 5) Instead of whole eggs, you can cut them into half slices and use it the masala. 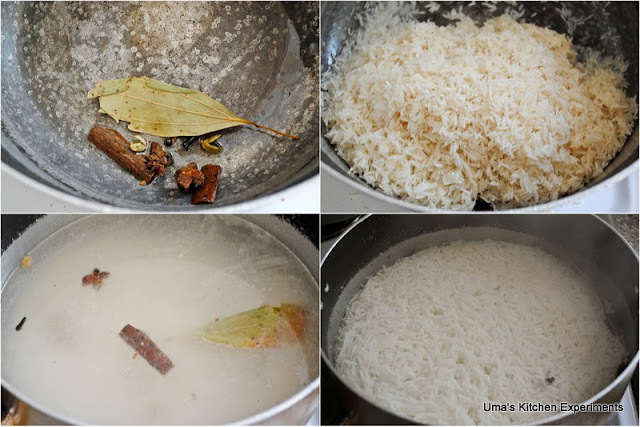 6) If you don't like the spice chunks (which we used while cooking rice) while eating biryani, you can tie them in small cheese cloth and put it with rice and water. Once the rice is cooked, you can discard it. 7) Add 1 chicken stock or vegetable stock cube while cooking the rice to get nice flavor and taste. But I used only plain water. Wow Uma! 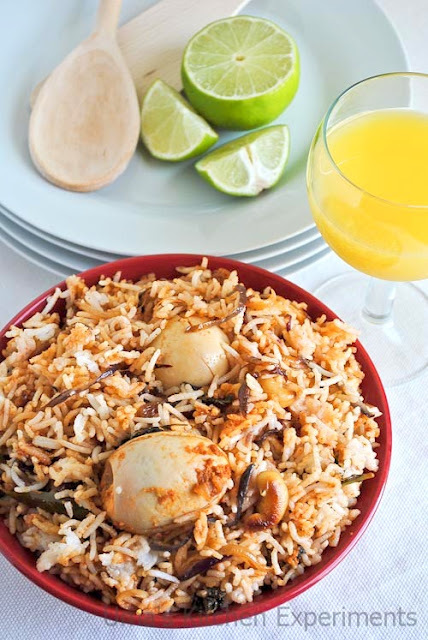 Your egg biryani looks stunning! I am so glad that you enjoyed it and thanks for the mention! Great presentation and pictures too! Spicy yum biryani,makes me hungry,nice presentation Uma. My weekend lunch,made delicious..inviting clicks!! I too had only once tried Chicken Dum biryani, so lengthy process but its worth trying...egg dum biryani looks so inviting n yummy!!! This has been in my to dolist since long..urs tempt me more...yummy looking egg biryani! wow wonderful preparation, so inviting clicks!!! Your pictures itself speaks a lot Uma, can guess how delicious and flavourful this briyani will be. Tempting biryani...Love to have this for lunch..yum.. The dum biryani looks finger licking good !! That looks gorgeous and loved the prepapration method...thanks for the step wise snaps! 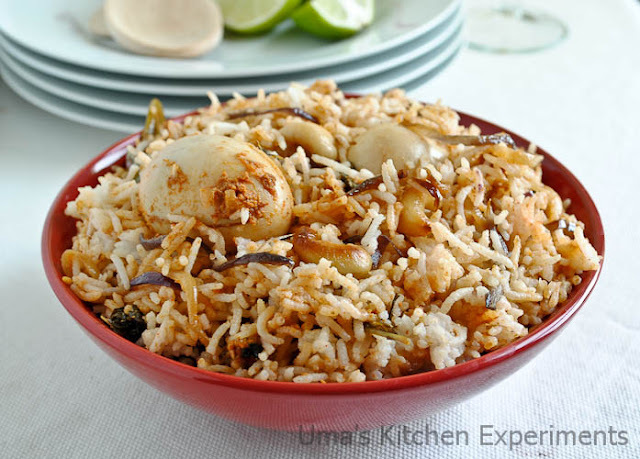 When it comes to Biryani, I always think of Chicken or Mutton Biryani, but your egg biryani looks delicious and awesome!